Filipina Artist, Ronna Manansala, is the granddaughter of the Philippines’ National Artist for Visual Arts, Vicente Manansala, a painter and sculptor. Her childhood was spent with fond musings of her family in the Philippines. Weekends and summer holidays were spent in the house of her grandfather, Lolo Enteng. In terms of interpreting Mang Enteng’s (his folksy nickname) themes, Ronna opted for her progenitor’s time-related exemplification instead of adapting in current terms. Yet, Ronna did not choose a direct version of his style but opted to do it in a differing manner, through bold colors and sure brushstrokes in the broader concept of the original cubism that is distinctly her own. They are not subtle but brash, choosing to continue his use of decorative linear planes that run counters to her femininity. Ronna Manansala picked female themes of mother and child, grieving Virgin Mary, market vendors, gossiping women, and family meals and stayed close to his style that departed from analytical cubism or the intentional breaking down of subject into near abstract form. There is a striking semblance to her artworks compared to Mang Enteng’s. 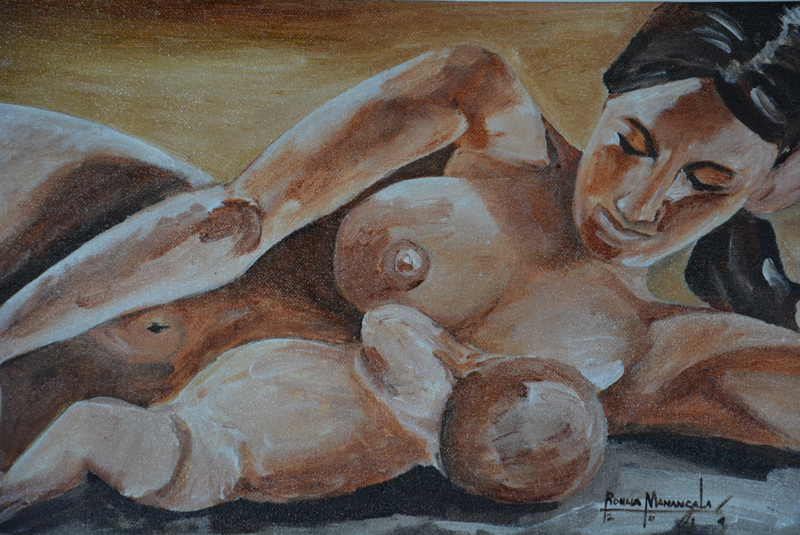 She would use the same subjects of ordinary rural Filipino folks in various activities, painted in cubism style in brown and earthy tones reminiscent of a Manansala masterpiece. What makes her works exclusively her own is that she is able to project the raw and pure character of a strong woman in her works, depicting her grandma, mother and herself. Ronna Manansala works silently speaks of the true beauty of a woman, calm, simple, strong and in touch with God. She is always inclined to do mother and child as she treasures the love of her grandma and mother. And so she paints, and amidst the smell of paint and turpentine she’s suddenly transported back in time to a place she calls home, in the comforting arms of a real life hero she fondly calls Lolo Enteng.